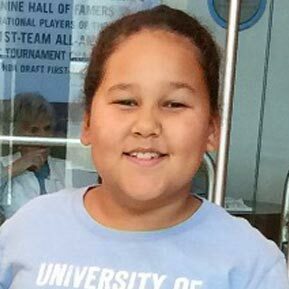 Ava is 9 and loves to play with her cousins, jump on the trampoline and be with her family. Ava is suffering from a CVA stroke and has right side hemiparesis but she isn’t letting that stop her from dreaming of becoming an artist when she grows up! She can’t wait to get to Disney to meet Belle and tell her just how beautiful, talented and intelligent she is (Ava and Belle have a lot in common!). Ava’s dream is seeing all of the Disney characters, riding all the rides and staying in a hotel room! We can’t wait to meet you, Ava!! Click here to help support Ava’s trip to Disney World with us in October!